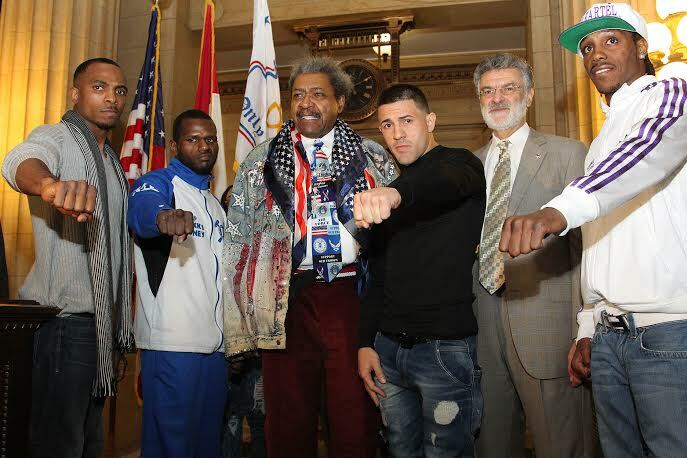 CLEVELAND, Ohio – Legendary Hall of Fame promoter Don King and Cleveland Mayor Frank G. Jackson held a press conference in the Rotunda of Cleveland City Hall on Wednesday to introduce the fighters that will compete on ShoBox: The New Generation this Friday, Feb. 21 from the Wolstein Center at Cleveland State University in Cleveland, Ohio. In the main event on SHOWTIME (10:45 p.m. ET/PT, delayed on the West Coast), heavy-handed lightweight slugger Angelo “La Cobra” Santana (14-1, 11 KOs), of Miami, Fla., will face the dangerous, world-ranked Hammerin’ Hank Lundy (23-3-1, 11 KOs) of Philadelphia in a 10-round bout. In the opening match of the ShoBox telecast, undefeated Amir “Young Master” Imam (12-0, 11 KOs) will take on fellow unbeaten Jared “The Quiet Storm” Robinson (14-0, 6 KOs), of Charlotte, N.C., in a 10-round super lightweight match. Imam, of Albany, N.Y., has won 11 consecutive fights by knockout, all but one inside three rounds. Mayor Jackson thanked King for bringing the event to Cleveland and for his continued generosity to the Cleveland area. “Mr. King has a great tenacity about him that has allowed him not only to make his fights successful, but to make him a successful man in this world,” Jackson said. Tickets to the event – priced at $35, $75, and $125 plus tax and fees – are on sale and can be purchased through the Wolstein Center box office and website www.wolsteincenter.com or by calling Charge-by-Phone 1-877-468-4946. Doors open at 7 p.m., and a full undercard will be presented prior to the televised matches. “I’m going to beat the hell out of him. In the ring, he will be beaten. It will be bad and it will hurt. “For my last fight (a loss to “Baha” Mamadjonov), it was very hard to make weight. I had a lot of family problems. My grandmother passed away. I had two injuries in training, in my back and in my knee. I could not train. I gained weight. I had to lose 38 pounds in a month and a half. It was really, really hard. “This fight is going to be different. Now I have Alejandro Fernandez as a strength and conditioning coach. This is the first time I’ve ever worked with a coach like that. My weight is great already. My father also came from Cuba to Miami to help me train in August. “The loss did have a positive effect. I learned a lot. I never imagined I was going to lose that way. But that’s in the past. Now, it’s a new Angelo. I’m working hard and I’m ready to go. “I’m on fire. I have nothing but hatred inside right now. When I get in the ring with this guy it’s going to be blood, sweat and hurt. Mark my words. “You (Santana) jumped up out of your league. When Friday night comes, Hammerin’ Hank is going to bring SHOWTIME to Cleveland. “Where I’m at in my career, it’s a new beginning to fight on ShoBox. I think this is a great fight for me. I’ve fought on television before but I’ve been dying to get on SHOWTIME so I appreciate this big opportunity. “I’m always fighting on the road so it’s no big deal. I’m not going to curl up and freeze. I have a proven record against good fighters. So for me, once again, it’s gut-check time and time to put on a show and bring it on home. “I’ve watched Santana about three times. I know what he’s going to do, what kind of punches he’s going to throw. Sure, he can punch, we know that. But what I do, I make the fight one-dimensional. All he’s going to do is look for that one big punch. He hasn’t been tested. I’ve seen him fight a guy that was 11-1 and the guy stopped him. There are a lot of things that I see with him that I’m going to take advantage of. “I’m ready to put on a show and do what I have to do to win. Its ‘Young Master’ time, baby. I’m ready for the big stage. I’m ready to put on a show for Cleveland and the rest of the country. “I’ve pretty much been in training since my last fight. I don’t know anything about this guy I’m fighting, just his record. I don’t look at videos. “The best man is going to win Friday night. We’ve all put in the work in the gym. The only thing left to do is fight. And, believe me, I’m ready. “It is definitely my greatest opportunity and biggest fight. It is just an unbelievable feeling that after working at something so long you finally get the kind of opportunity on a big stage that all of us fighters aspire to be on. I’m grateful to be in this situation, to reach this mecca and I can’t wait to see what happens after. I have nothing but gratitude and good feelings about this fight.